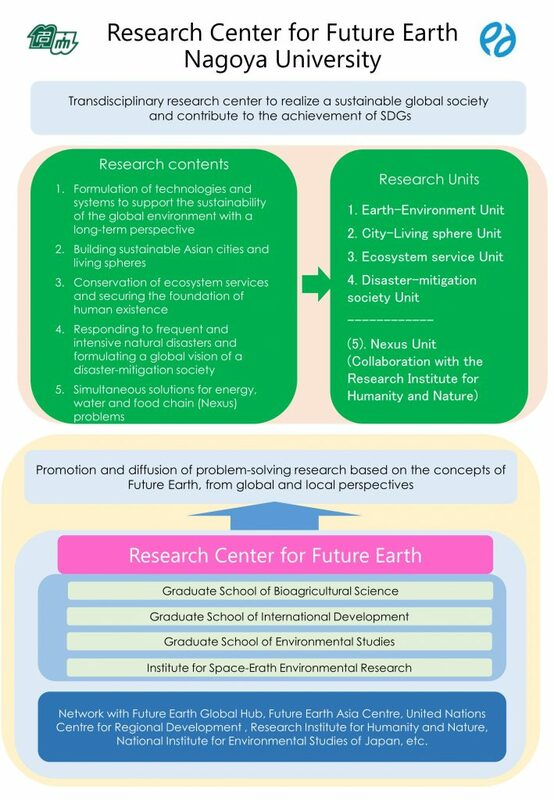 Based on the world-leading accomplishments of Nagoya University in a range of research areas including earth environmental studies, forest ecosystem research, and sustainable regional development, the Research Center for Future Earth is designed to enable Nagoya University to meaningfully participate in the Future Earth (FE), a global academic platform. The center aims to contribute to resolving a variety of global and local-scale issues related to FE, and to the achievement of the Sustainable Development Goals (SDGs). The center will implement the following FE concepts into concrete research topics, providing leading examples for the international academic community: (1) solution-oriented, (2) effective interdisciplinary collaboration, and (3) transdisciplinary research design and initiatives. To establish the Research Center for Future Earth, Nagoya University closed the existing Study Consortium for Earth-Life Interactive System (SELIS), which was the successor organization of the 21st Century Center of Excellence (COE) program. To date, SELIS has functioned as a collaborative organization of researchers focusing on natural science, investigating the biosphere-geosphere of the Earth. However, FE is strongly focused on interdisciplinary research, including diverse fields such as social science and humanities, and interdisciplinary collaborations that transcend the boundaries between academia and society. Therefore, we have expanded the framework of SELIS to establish the Research Center for Future Earth. 5) Simultaneous solutions for energy, water and food chain (Nexus) problems The Center will be involved in the Graduate School of Bioagricultural Sciences, the Graduate School of International Development, the Graduate School of Environmental Studies and the Institute for Space-Erath Environmental Research. The center will be organized into the following four units (1)-(4) with researchers organized around the five tasks described above. Nexus problems (5) will be examined in collaboration with the Research Institute for Humanity and Nature.